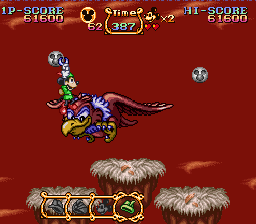 SNES The Magical Quest Starring Mickey Mouse (USA) in 15:28.97 by Cardboard & Recca. Mickey Mouse is on an adventure to save Pluto with a bunch of suits with various powers. This movie is a 27 second improvement of the previous movie. The constant jumping is necessary to preserve the speed gained from running downhill. Other specifics on the improvement can be found in the submission comments.